Legio Minimus: Necron Army Complete! It took a while to actually get a chance to get a real shot of the whole army together. Overall the army took me about 16 days total to paint (full days…like 8-10 hour days). When you consider that my Dark Eldar took a full year of work or my Nids were about two I think that is a pretty epic feat lol. Overall I am very proud of this army to the point where I would put it on the same mark as my DE. The reason I say that is because of how little time it took to paint because of the techniques and limited palette I chose to work with. Just goes to show that because something is speed painted doesn’t mean it has to look bad lol. The “allstars” of this list are the Solar Pulse and that 20 man warrior squad. The reason I love the solar pulse as much as I do is because being able to control night fight against all opponents can be potentially game winning. The durability it adds to all your vehicles since they are skimmers cant be understated. Basically, if you move all your AV 13 vehicles will have a minimum of a 4+ cover save. You get in decent cover from 24”+ it can get down 2+. Very rarely do I surrender “first blood” even when going second because of the pulse. Another nice benefit is that half the time the first two turns you have night fight on, which is amazing. The second key piece to this list is that 20 man Warrior squad. When you combine the size, the 4+ resurrection protocol, their standard 4+ save and the nearby ghost ark you have a squad that can take anything you throw at it and still remain close to max strength. How I use this unit is to draw my opponents units towards my lines while I get some shots off at tanks, softening up their troops, etc. and RIGHT before he is able to assault I veil to the other side of the board normally into his un-protected backfield or onto an objective. I am constantly blown away at how well this works. The runner up prize oddly goes to the Stalker. The reason being is 100% based on twin linking everything in your army when firing at his target squad. I cant get over how well this works combined with the style of shooting for this army (volume of fire). Just awesome lol. I am hoping to be doing a tournament on Dec 1st with these guys (at 1500pts so I drop the Scarabs and Spiders) so I will obviously be doing up a tournament recap. I am also hoping to get in some battle reports too. Your army isnt THAT bad... Our game would have turned out a lot closer had my dark lances had any effect throughout the first two turns. Fire 15 lance weapons and force a single coversave? Really? I am not necessarily saying that the army is that bad. All I am saying is that all my games to date havent really been close. In my last game against Matt he got both of his blob squads in on my main Warrior squad and they lived through the entire game with 19 models left. One thing I havent played against is fast, hard hitting CC squads, like Thunderwolves or spawn. I am interested to see how well the army does against units like that. I am doubly interested to see how the army does against the new Chaos Book since I havent seen it being played yet. Nothing wrong with the army list. I think it would be nice to play against as it is quite varied - the only duplication is 2 annihilation barges and two warrior units (and even those warrior units have different roles). 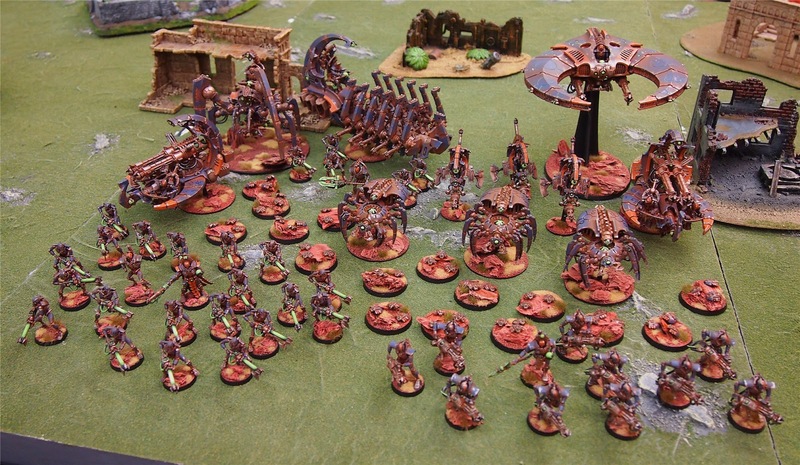 I think your wins are more down to your good generalship from using the army for so long, and the fact that it's not one of the the typical necron builds (flyer spam, wraith spam, scarab/sypder spam). If you played all your 6th edition opponents again I think the games would be closer because they would be more aware of what you list does and how tough the big warrior unit is. The warrior unit is a nice bait. By the time an opponent realises how tough it is they have already committed resources to kill it, and already on the road to losing the game because coming with range of that unit without some of the support elements gone is near suicide. Has any of your opponents had a mobile force which tried to stay 30" (6" move + 24" range) away from all or the majority of your army for a turn or two ? It could give them the time to take out some of the support elements (barges, ark). 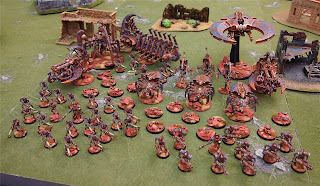 @ Rathstar: There are definitely many good counters to this army. As I mentioned I tried to design it to be balanced and hopefully fun to play against (mostly luck dictating friends not having fun against it lol). Things like a decent round of shooting by a Dark Eldar army with Dark Lances (aka NOT by my friend Jon) and that is all the tanks done. Once you remove the Tesla Destructors this army looses a huge amount of bite. The other big one are armies that have fast, heavy hitting close combat squads. I see flying Demon Princes (or Demons in general), Thunder Wolves, Spawn, etc. being very difficult for this army to deal with. The funny thing is I see the single hardest match up for me is my main army, and thats Nids. You combine assault elements that can hit you from reserve like Ymgarls and a whole slew of big critters with FNP and decent saves and there isnt a whole lot one can do in my mind. Luckily for me not many people other then myself play Tyranids in these parts and those that do are really new to the army. I am REALLY hoping to do a tournament on the 1st of December (as I mentioned) just so I can get in some games against some more varied opponents. What makes your army great is that it seems to encapsulate everything that 6th edition is about. You have a strong hybrid of mechanized & foot elements, the foot elements you do utilize are VERY resilient, you have fast elements (the scythe, bikes & veil)and of course make use of the new unit type without abusing it. All said it is a very well balanced army that is able to maximise its strengths & doesn't try too hard to cover its weaknesses - you avoid combat by presenting AV13 walkers, a ninja-teleporting squad & having the scariest character defence in the game. I think a traditional guard army may give you difficulty though - The good ol' manticore seems like it could cause you some concerns as S10 ordinance barrage doesn't care too much about your quantum sheilding and makes a mockery of the warrior squads 4+ save. Looking really good, mate! I noticed a lot of Necron armies using the rust colors lately. It's a good change from pure metal. Tomb Spiders and Scarabs Complete!